From a BYOD (Bring Your Own Device) programme to a 1:1 iPad initiative there are a number of options available to schools when embracing new technology in the classroom. Consequently it is becoming common for school leaders to purchase a device to trial in the classroom before making any real financial commitment. MULTIMEDIA OPTIONS – Use the camera/video to display student work to the rest of the class. A simple convertor cable will allow the iPad to be displayed on an existing VGA projector. SKITCH – Annotate any image/diagram before the lesson or in real time to illustrate a concept. Students can also be asked to complete annotations on the iPad. DROPBOX – A shared classroom account is a workflow solution. This can run alongside the ability to upload to Dropbox from the iPad and display on existing computer/projector via web based Dropbox. VOICETHREAD – A class account will allow students to collaborate online prior to the lesson and then view work via the iPad when they come together. The literacy implications of Voicethread make it an interesting initial collaboration tool. ITHOUGHTSHD – A mind mapping tool with a host of functions. Allow students to contribute to the discussion and link ideas to web addresses or photos.Works very well as the mind map can then be shared with the class. EXPLAIN EVERYTHING – Allow a student(s) to complete an interactive whiteboard slide that can be displayed as a plenary tool for the class. This has the added benefit of extensive sharing options for future reference to enhance learning. SOCRATIVE – If students have access to any internet enabled device (laptops/ICT suite) then this assessment for learning tool fits neatly into classroom practice. The instant-on nature of the iPad aids Socrative use whenever the educator wants to assess the level of learning. The ability to hide results is beneficial as it empowers students to answer without feeling too much pressure. SKYPE – Encourage collaboration across the school/country/world with other students and experts in the field of study. 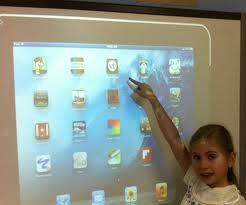 The mobility of the iPad allows individuals to enter the conversation or join together to contribute to discussion. EVERNOTE – Allows the educator to have resources readily available. Embed resources in schemes of learning and access them for display with one touch. The instant-on functionality of the iPad means lesson pace can be easily changed with resources to hand when required. Evernote can also be used as a shared folder utility with cross platform integrations making student access at home a simple process. Of course there are any number of apps that will enhance learning as well as those above. From presentation (Keynote) to creation (Garageband), the beauty of the iPad is that applications are constantly being developed and with educators in mind. The ten listed above have proved successful but they are only a suggested starting point. The developing pedagogy is under constant scrutiny and the iPad should only be seen as an additional tool for the educator. That said, it is a fantastic addition to the toolbox and if you have the means I urge you to experiment. Director of Innovation & Learning at the Stephen Perse Foundation schools, Cambridge, UK (stephenperse.com). Interested in global connectivity for all and risk taking in education. Keen to discuss all aspects of learning and digital strategy. Also @syded06 on twitter. Voice thread is a new one to me, looks really interesting – useful, as ever, thanks. Multimedia options – Apple TV plus an HDMI to VGA converter box allows you to use the built in Airplay to display through a projector, no more swapping cables or need for Airserver. Thanks for commenting and I completely agree. However for a trial it is worth the cheap option to demonstrate the airplay ability before committing to apple tv and converter box. I use Apple TV at work to share presentations via iPad on Slideshark (free) and love the ease. However, I opted to try AirServer (trial version) at home. All it cost was an 11.99 HDMi cord to connect to the TV. Works great! As an educational consultant it will be a good option to offer school districts on limited budgets. Dale, we have done the opposite, we were using Apple TV, but now moving more to air server. Experiencing some sound issues. One of my favorites is the Educreations Interactive Whiteboard app, which is free, at least in the US. It is one of the quickest and easiest ways for students to make screencasts. I can walk around the room and ask several different students to explain how they solved a math problem while I make a screencast. The screencasts can be replayed on the whiteboard for the whole class to see different methods of solving the problem (or in some cases what went wrong). I’ve only had a brief look at Doceri but I do know a number of people like it. Love it! I am familiar with many (but not all) of these, but our school is doing exactly what you said – investing in enough iPads for some teachers to have one in a classroom. It’s nice to have a place to start. Thanks for this! No problem. Thanks for commenting. How do we prepare our children for tomorrow? This work by Daniel Edwards is licensed under a Creative Commons Attribution-NonCommercial-NoDerivs 3.0 Unported License.